Nintendo has revealed a September launch window for the next wave of Amiibo figurines. This upcoming wave of Amiibo includes Bowser Jr., Dr. Mario, Ganondorf, 30th Anniversary Mario Classic Color, Olimar, Zero Suit Samus, and will launch right alongside of Super Mario Maker on September 11th. 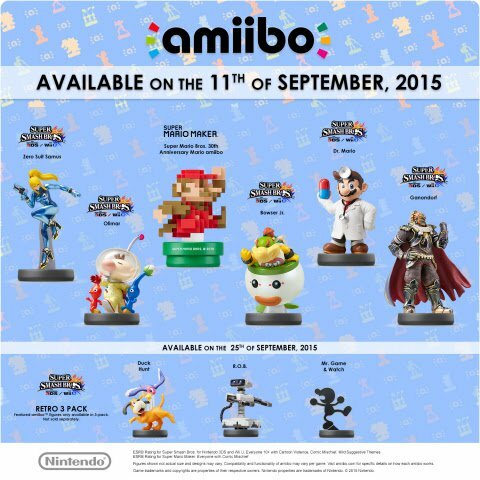 However, these six will not be the only Amiibo to launch during the month of September. The “Retro 3-Pack” will arrive on September 25th, featuring Game & Watch, Duck Hunt, and R.O.B. These two groups of Amiibos launching in September will enable you to add 9 more Amiibos to your collection by the end of September. That is, if you are willing to fight the initial rush to get them. Whether or not that is worth it is up to you. There is also the “Mario Modern Color” Amiibo, which has not been given a release date just yet. Note that this is NOT the same thing as the “30th Anniversary Mario Classic Color” Amiibo, which is the 8-bit Mario Amiibo. According to Nintendo, information on the release date of the “Mario Modern Color” Amiibo figurine will be revealed in “the future”. Of course “the future” is a very vague statement, so we will have to wait and see on that one. Amiibo have been around for almost a year now, and some gamers feel that they are overpriced or simply aren’t being used in games to their full potential. And of course, no one could possibly forget the plethora of supply issues that Nintendo has had with Amiibo so far. Hopefully Nintendo can address some of the community’s concerns with regards to Amiibo in the future. In spite of those issues, Amiibo are undoubtedly a great collector’s item whether you think they have problems or are fine just the way they are.